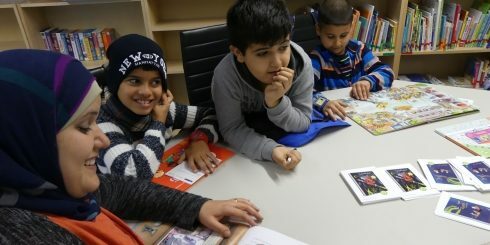 Friendly trams and wandering frogs: the Goethe-Institut is using children’s books in German and Arabic to make it easier for young refugees and their parents to come into contact with the foreign language and a foreign country. A visit to a refugee shelter in Berlin shows how well the “Einfach lesen!” project is being received. In the book room at the refugee shelter, seven children have gathered about Amena Ragess, including her ten-year-old son Farouk. They are listening raptly and attentively to the story of a tram that got tired of its bland everyday and decides to break out of its usual route. On the way to the forest, it picks up animals like a rooster, a donkey and a cat. Amena Ragess and the children imitate the hee-haw and meow of the animals together. Then Farouk reads a passage in Arabic aloud. It’s not unusual to hear stories at the refugee shelter in Berlin’s Reinickendorf neighbourhood. Twice a week, every Wednesday afternoon, volunteers from the initiative Willkommen in Reinickendorf come here to read stories from German children’s books aloud to the young refugees. What’s new is that now the children also are able to arrive in the foreign country in their own language. The Goethe-Institut and Verlag Hans Schiler issued a six-part German-Arabic children’s book series under the motto “Einfach Lesen!” (Simply Read!). They published bilingual editions of classics like Die ganz besonders nette Straßenbahn (The Very Friendly Tram) by James Krüss, Paul Maar’s Einer mehr (One More) and Ernst Jandl’s fünfter sein (English title: Next Please). They are easy-to-read, colourfully illustrated stories that can help the young listeners as well as readers understand their new home and relate to their own experiences. Farouk attends the Welcome Class at a primary school in Reinickendorf and already speaks German well. “We learn science, German and maths,” he says. Farouk and Amena Ragess are from Damascus. His father is still there. The mother and son fled to Germany via Turkey, Greece, Albania, Serbia and Austria. “We walked across many mountains,” Ms Ragess says, describing the arduous journey. They finally crossed the German border on 18 May 2015 – she remembers the date very well. A few weeks later they arrived in Berlin. They now know the city quite well, reporting about Alexanderplatz and Zoo. Yet they have had most of their experiences so far inside the refugee shelter where 900 people, including 200 young children, live in four buildings. What image of Germany do the bilingual books convey? Amena Ragess, 39, who taught social studies in Syria, pauses to think. “You see a lot of the landscape, the mountains and forests. You notice that Germany is a diverse country,” she responds. Ragess herself likes Paul Maar’s book Eine gemütliche Wohnung the best. It describes a home that has a kitchen and a washing machine; that reminds her of Damascus. 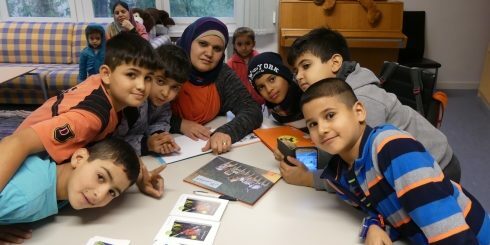 Susan Hermenau, who works for Prisod Wohnheimbetriebs GmbH, which operates the refugee home, is delighted that in the books “travel and new beginnings are related so positively. The protagonists are optimistic and face their adventures – that helps the children.” In addition, the books transport universal values like friendship and helpfulness. “Cultural differences that they reveal don’t alienate them, but unite,” Hermenau believes. Reading aloud is also a very positive experience for the parents because there is no language barrier to hurdle and it helps them with their self-empowerment. “We are especially happy about such programmes that give our residents the opportunity to become actors,” says Hermenau. In addition to the book package, audiobooks read in Arabic are also available, including classics like The Little Witch by Ottfried Preußler and Cornelia Funke’s The Thief Lord. This project is called “Einfach Hören!” (Simply Listen!). Postcards with the QR codes for the podcasts were distributed in the Reinickendorf facility. It is hard to assess how many residents are making use of them, however, as a device with Internet access is needed and not everyone has it. At any rate, the children’s books, as Amena Ragess explains, “help learning German because they’re written in simple language.” When they arrived in Berlin she and her son did not speak a word of the foreign language. While the mother is now attending a course to improve her skills, her son Farouk is making great progress at school. He can also tell the story he liked to hear most in Syria in simple German. It is called Leila and the Wolf; known here as Rotkäppchen or Little Red Riding Hood.